In 1908, Enzo Ferrari loved racing after his father took him to a race in Bologna. His dream to become a race Car driver became reality in 1919 when he made his racing debut at the age of 21. 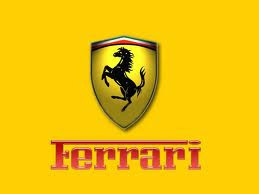 The Ferrari symbol is a black Horse on its hind legs with the initials "S.F." on beneath it. The first Ferrari car, the Tipo 815, was created by Enzo Ferrari in 1940. At the end of the war, the company changed its name to Ferrari and designed the 125 Sport, a 12-cylinder, 1500 cc car which Franco Cortese drove on the Piacenza circuit on May 11, 1947. The car had to retire, but it was ahead in the last lap, in what was a good debut. Two weeks later, in fact, Cortese and the 125 Sport won the Rome Grand Prix. The mid-engined Dino 246GT was unique in that no where on the car did the word 'Ferrari' appear. Phil Hill's Dino 246 won the 1960 Italian GP - the last major victory for a front engined GP car. Best selling Ferrari of all is the 1986-89 328 GTS (6,068 made). One of Ferrari's most unusual projects was the "BIMOTORE" racer/record breaker. A single seater with an engine at both ends. Enzo wasn't making or racing cars he liked to relax by riding his (British) Rudge motorbike. The 308GT4 is the only production model Ferrari designed by Bertone, the prototype only Ferrari Rainbow was another Bertone/Ferarri creation - most have been fashioned by Pininfarina. The 308GTB was the only Ferrari with Glassfibre bodywork. It was soon re-engineered in steel. Most expensive Ferrari was a 250GTO which changed hands for £7.2m ($12m). Ferrari engines have been used in the Lancia Stratos, Lancia Thema 8.32 and the Fiat Dino. The F50 was Ferrari's half century celebration. Just 349 were made. The 1976 Ferrari 400GT was the first to come with an automatic gearbox. The '89 Tipo 640 pioneered semi-automatic gears in F1. Nigel Mansell won its first race in Brazil. Enzo's title, "Il Commendatore", was given by Italy's fascist king Victor Emmanuel III. His factory was part government financed during WW2 so he could make tools for Mussolini. Enzo's mother died in 1965 after, apparently, choking on a boiled egg. 1985 a 250LM brochure fetched £1,070 ($1,800) at auction - a world record. Tractor tycoon Ferruccio Lamborghini decided to make a supercar of his own after his complaints about the quality of his Ferrari were met with frosty indifference. The "Ferrarina" was a pint sized version of the Testa Rossa designed by Ferrari engineer Giotto Bizzarini in 1958. It had a 1,000cc 91bhp all-alloy four cylinder engine and could reach 113mph. Enzo hated British GP teams, but in 1988 the Ferrari F1 chassis design HQ moved to Guildford, Surrey, UK. The car won first time out. Ferrari won 25 championship titles in a 500 F2. The horse first appeared on the radiator grille in 1959. Produced by the Turin company Cerrato for the cars with body by Pininfarina, and etched by Incerti for Scaglietti cars, it was cut out of 3 mm thick sheets of brass pantographed and chrome-plated. It remained the same until 1962. Between 1962 and 1963 the horse was produced in relief but it was not a success, and was only used for a year, being judged stylistically and proportionally unsuitable. A subsequent version was developed, with a flat horse pantographed on aluminium and then mirror polished; it was introduced in 1964, adopted until the BB model, and then recovered in 1984 for the Mondial, 328 GTB and GTS, while an identical, anodised version in black adorned the first Testarossa and 348. A new relief version of the horse was proposed in 1963, but this too met with little enthusiasm. However, its development went ahead, so that it could be used if necessary on the rear of the car, as it was on the Mondial in 1988-89. And that was how the ornamental horse, destined to become an extremely familiar sight, came to be created, almost unwanted. It was to remain substantially the same for over 30 years, adorning the back of nearly all Ferrari models, with only small variations to the colour and size. In 1982 it also appeared on the front of the cars, replacing the flat pantographed version. Since 1992 it has featured on the entire Ferrari range, with well-defined forms for use on the front and rear. From 1953 to 1961 a trademark combining the initials of the Ferrari and Farina names in the naval alphabet, was used on cars designed by Pininfarina. The red rhomboid against a white background which indicated the letter F, was replaced by the letter P (white rectangle in blue field) when the designer changed his surname to Pininfarina. This trademark was generally abandoned in 1964, except for 2+2 models; and currently appears on the front tunnel of the 456 GT. Until 1981 Ferrari racing car were built at Maranello. In 1982 a plant was built next to the Fiorano test track specifically for the design and production of Formula 1 cars. Racing car components are also manufactured in the main plant, particularly in the Composite and Foundry and Ges Mechanic Departments. Since 1993, Ferrari "gentlemen drivers" have been able to take part in an exclusive championship and fight for victory driving a racing version of the F 355. Evolution of the Company name: September 1939: Auto Avio Costruzioni, owned by Enzo Ferrari , 16 October 1957: Auto Costruzioni Ferrari, 23 May 1960: Società Esercizio Fabbriche Automobili e Corse - SEFAC S.p.A., 13 November 1965: Ferrari S.p.A. Esercizio Fabbriche Automobili e Corse, 23 June 1989: Ferrari S.p.A.
Current manufacturing output about 3,600 cars, in three models: 360 Modena, 456 M GT and GTA, 550 Maranello. Maserati was once Ferrari's bitterest rival. Now Ferrari runs Maserati - for Fiat. The red so typical of Ferrari was the colour assigned to Italian cars competing in Grand Prix races by the International Automobile Federation in the early of the century. Not all Ferrari's are red! The factory currently offer a choice of 18 colors. Ferrari currently produced about 3,400 cars a year including 360 Modena, 456 M GT, and 550 Maranello. Until 1981 Ferrari racing cars were built at Maranello. But in 1982 a plant was built next to the Fiorano test track. Ferrari has direct sales branches in the US, Germany and Switzerland. Importers cover the other countries around the globe. Ferrari allows its clients to personalize their GT cars. The program enables the clients to have exclusive technical and aesthetical features in their vehicles, with about 50 different options available. Even the smallest need can be catered for. The Ferrari Owner's Club - a very exclusive group - has 18 chapters around the world. The world’s fastest Ferrari, the F60, was debuted in April 2002. Maserati which was once Ferrari's bitterest rival, now is run on a Ferrari engine for Fiat. The most popular Ferraris have always been the two-seated Gran Turismos. The Ferrari Owner's club has 18 chapters around the world. The black prancing horse in the famous Ferrari logo was originally the symbol of Count Francesco Baracca, a flying ace in the Italian air force. Ferrari of Italy is the oldest and most successful team left in the Formula One championship. The cheapest component in a Ferrari car is a 3 c washer. The most expensive Ferrari ever sold was 1957 Ferrari 250 Testa Rossa. The Ferrari has been featured in many films and television shows. Most expensive Ferrari was a 250GTO. It was sold for £7.2m ($12m). The F50 was Ferrari's half century celebration. Just 349 of them were made. Ferrari offers 16 different Color choices on its GT cars, including the famous Ferrari Red. The F60 that debuted in April 2002 is the fastest Ferrari. It can go from 0 to 100 in just 3.2 seconds. In 2006, Ferrari sold 5671 cars – 635 of them in the United Kingdom. One V12-engined car is sold for every three V8s.